Shown with Optional Cross & Pearl Charms. Absolutely beautiful, just like your little girl! Solid 14k rose gold heart pendant custom engraved with her name in stylish fonts she will love. Front side engraving is included with the following options: engrave your child's name, initial, or even a fancy monogram. Additional option on the back for a small message or note as well. 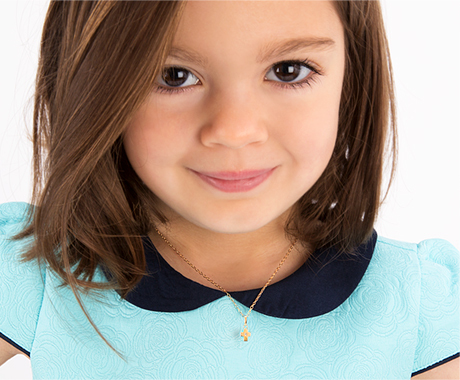 Personalize even more with her birthstone charm and more! An excellent, quality gift for any special occasion that will be cherished for a lifetime. Measurements do not include bail or ring at top. * Please Note: Because these items are permanently engraved and not returnable, we are unable to take phone orders for this item and must be placed online by the customer. We would be happy to help you through your order and answer any questions you may have over the phone. This necklace is stunning; the engraving is meticulous and the quality is extraordinary! Take personalization to the next level by choosing this heart pendant with her birthstone or other charm.